The spirit of “Aloha” symbolized by lei welcomes visitors to the islands of Hawaii. In Hawaii, garlands of flowers, lei, are placed around the necks of visitors. 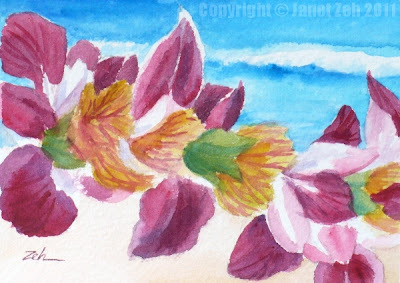 I painted this piece using as reference real lei of fresh tropical flowers. I included the ocean and beach in the background to indicate the shores of the island upon which a visitor traditionally arrives. You can find more of my tropical paintings here. Mahalo!